An anthropologist at the Vineyard. 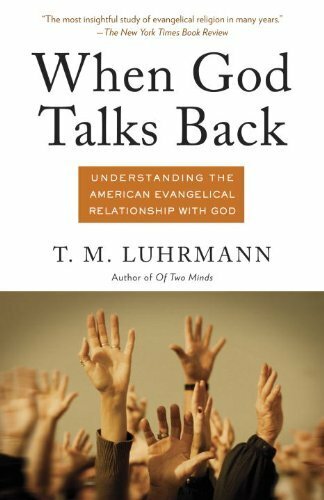 T. M. Luhrmann's fascinating new book, When God Talks Back: Understanding the American Evangelical Relationship with God, is an attempt to understand how is it possible for a living God to become real to modern evangelicals. To be a 21st-century modern, she claims, is to live in a technologically-mediated world built on the fruits of reductionist scientific skepticism and devoted to the empirical evidence of the senses. Modernity thus poses unique challenges to American evangelicalism, whose democratic, existential, individualistic faith calls people to stand before God and hope for what their eyes do not see and their ears do not hear. Such faith, she says, "asks people to consider that the evidence of their senses is wrong." How can this tension be overcome? The answer, according to Luhrmann, lies in sets of practices that allow "evangelicals" (we'll come back to that) to cultivate what she calls a "new theory of mind" by which God is experienced as an intimate, unconditionally loving, best friend who communicates personally with believers—a God who "talks back." Luhrmann argues that it is the inner experience of this personal communicative relationship in the imagination of her subjects that overcomes the disabling effects of skepticism about many other aspects of Christian faith. God's presence in the imagination is more powerful than God's apparent absence in the disenchanted sensorium, and, in fact, attention to God's presence in the imagination often leads subsequently to sensory manifestations. Doubt about God's presence does not disappear for Luhrmann's subjects because of this imaginative exercise—the difference is that they can meet doubt with a cognitive subjective relational response, as opposed to an empirical argument. Like Job, they can say in the face of radical alienation, "I know my Redeemer lives."